If you miss the ‘Kersplosh!’ of the hunting osprey look a bit closer to hand to witness aeriel chases at least as exciting. Dragonflies are one of the most spectacular insects of the summer months, the rustle of their wings whilst they hawk for unwary insect prey amongst foliage is as typical as their strikingly colourful bodies. One like this was spotted sitting on a shale bank by a Volunteer, on their way to the Upper Viewpoint at Dodd. Most Dragonflies spend a couple of years underwater but these Golden Ringed ones spend 5 years of their lives there as ferocious larva. Tadpoles and Toadpoles beware! They have a few weeks flying free in Oriental splendour before the cycle starts again. 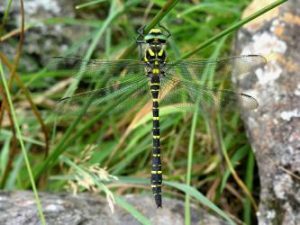 The biggest is the female Golden Ringed dragon fly, her length marked like a black finger set with with a series of multiple wedding bands. After the nuptial flight she lays her eggs by hovering over shallow water and vertically stabbing her abdomen into the stream beds.The acid upper waters of Skill Beck or the margins of the marsh land lagoons would do equally for a nursery. At Whinlatter, smaller but in greater profusion, Red Damselflies Pyrrhosoma nymphula are darting in linked heart-shaped pairs around the ponds. But if you look deep into the water you can sometimes spot the next year’s generation showing their true nature stalking the mud in search of dinner.